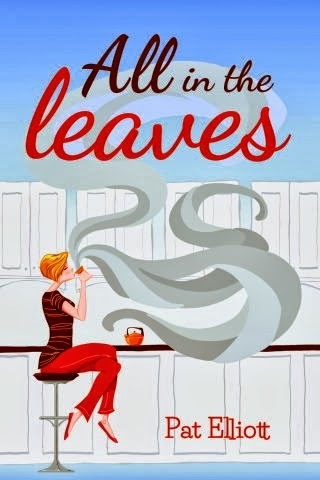 Do you still write letters, or do you only stay in contact via email? I still like to write a letter every now and then. So when I do, I paint a little card to go along with it, to make it extra special. I take a piece of Saunders Waterford paper 140lb, Rough. 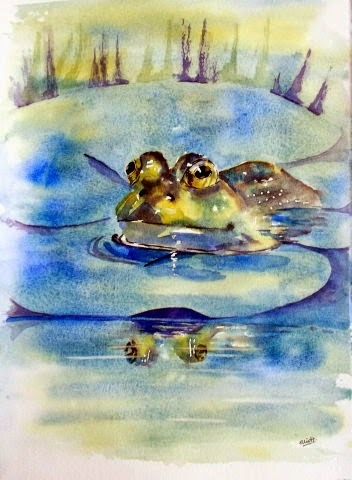 Size wise - about 8x 11inches. Fold it in half and run a ruler down the fold line to make a proper crease, that works like a hinge. Then the card will sit flat when you pop it in an envelope - and stand up like a bought card when the recipient opens it. The reason for this, is once you paint the card and take the tape off, it leaves a lovely neat edge which enhances the painting. The tape is low tack masking tape, specifically designed for painters. and somewhere in the world, someone will be opening a card like this, very soon. Why not make your own and send it out in the world? I know it'll be appreciated. After the demo, incorporating negative painting into a picture. 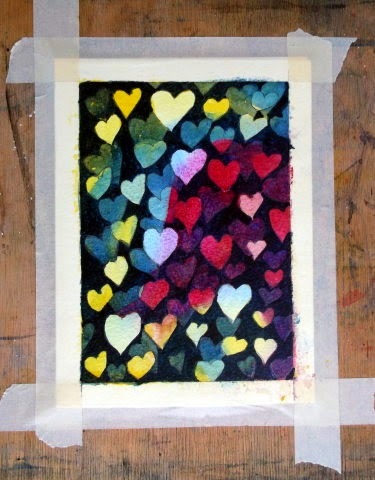 after demonstrating the hearts, I thought I'd show you how you can incorporate some negative painting into a picture. 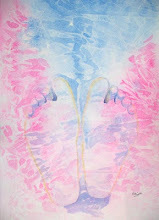 So here is my painting - if you look closely, you will see where the negative painting has been applied. Remember, negative painting is where I paint the area around the object and not the object itself. Or you could just sit back and enjoy the view. 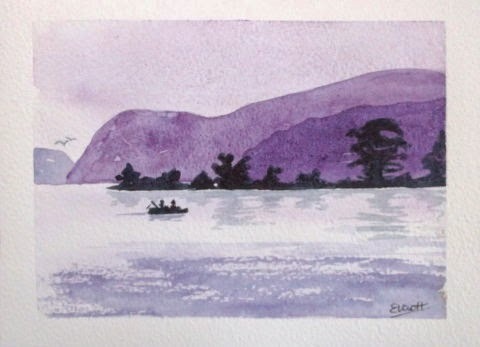 Painted on Saunders Waterford, 140lb Rough. 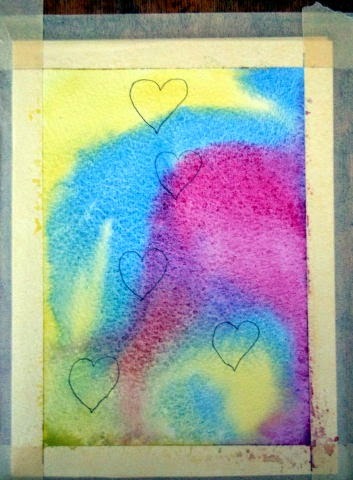 Always - a demonstration of hearts and negative painting, ahead of St. Valentine's Day. It seems such a long time since I did a step-by-step demonstration. 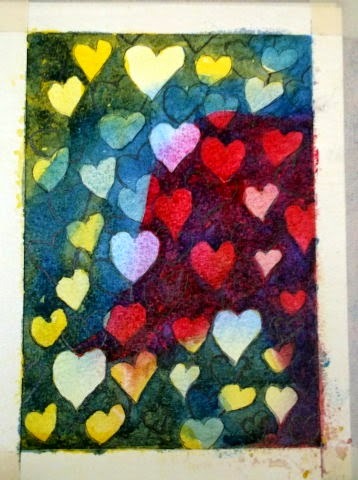 Here though, is one for a hand painted card, made up of hearts, in time for St. Valentine's Day. Go on, give it a go, and surprise that special someone in your life with a handmade card! Here is how to get to that finish, step by step. 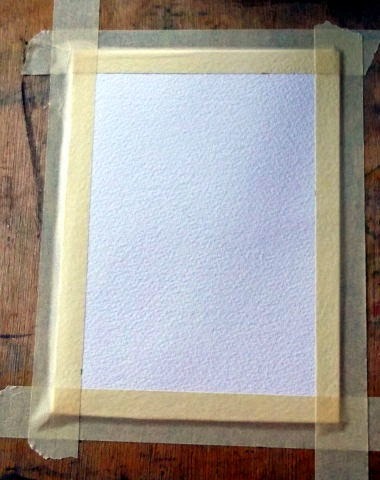 Firstly, take a piece of watercolour paper, 8" x 11" and fold it in half. 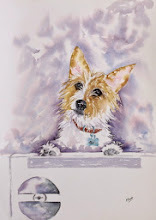 I use Saunders Waterford 140lb Rough. 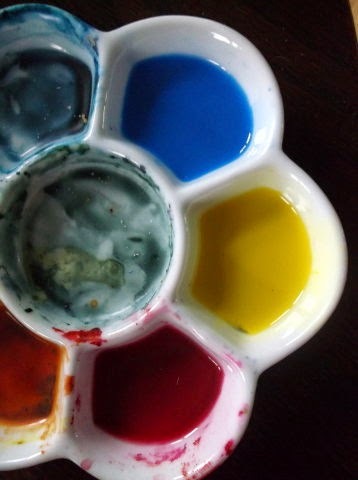 Line up your palette, with three washes, one yellow, one red, one blue. 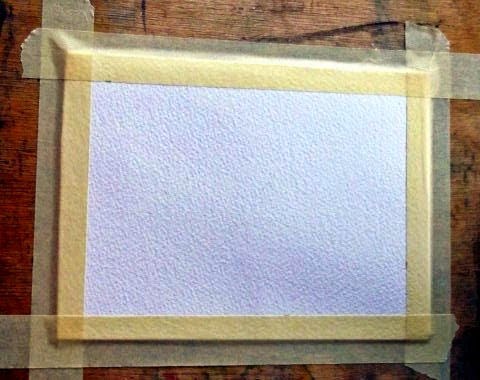 Then you wet the whole of the paper with plain water. 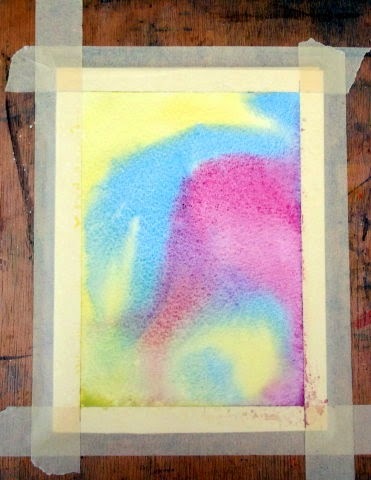 Dip your brush in one wash then apply to the paper, with a random swirl, while the paper is still wet. Do the same with each wash. 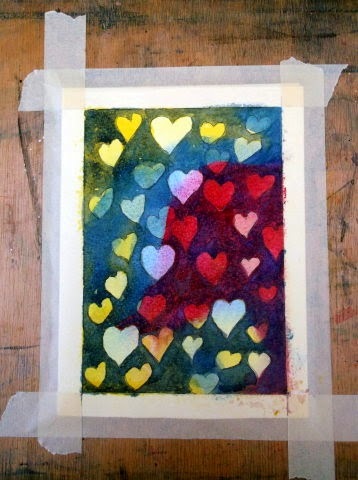 Using just the yellow wash, paint around the hearts and all over the background. 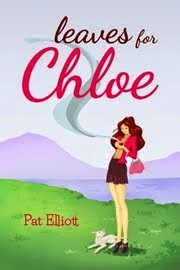 This will give one unifying wash under all the others to follow. 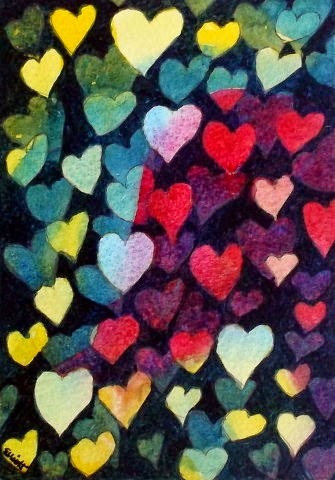 Never paint over the hearts! We are painting the space around them. This is negative painting. 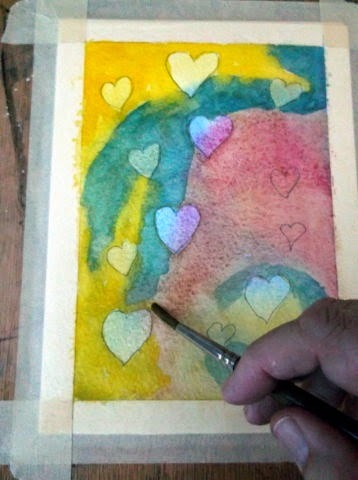 When the painting has dried completely, go back in with your pencil and draw a few more hearts.This time, use the yellow, blue and red wash in line with how they appear on the under painting. Don't worry if they fizz in together as you paint. Never paint over the hearts you have drawn. 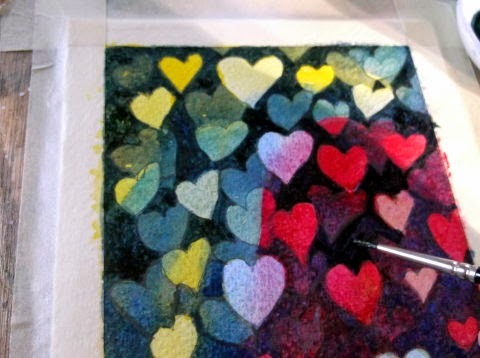 Then when completely dry, add some more hearts. Once this level is completed, it should look like this. This is what I call the ugly stage - but don't panic! It is simply a stage - it will get better. Persevere! This time, we're going to take the blue and red washes, and mix them together. With this new lavender/purple wash, you are going to paint all around the hearts again, remembering not to paint the hearts. Now, we could have stopped here, but it didn't feel finished to me. I wanted to go wild with hearts - so we draw in some more! You might have to look closer to see these. Click the image and it will come up larger. For this next background wash, we are going to take the mix of blue/red and add in a touch of Payne's Grey. 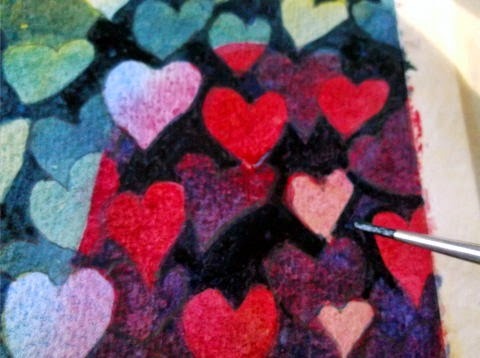 Then make sure you don't paint over any hearts, simply the space between them. 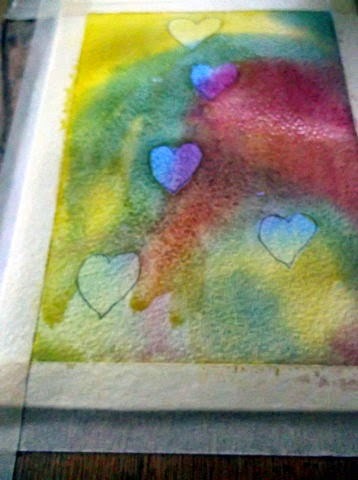 When you have painted every space in between the hearts, you should have a card that looks like this, before you remove the masking tape. 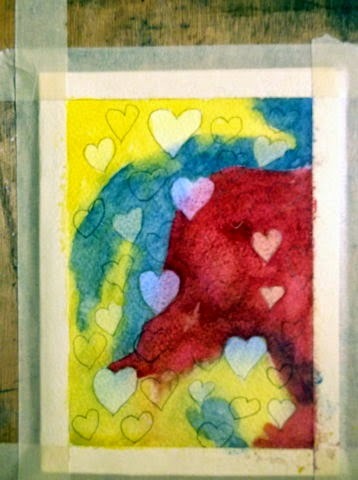 and once you remove the tape, here is the card your beloved will enjoy on St Valentine's Day. What a great way to express your love! Much better than a card from a store. 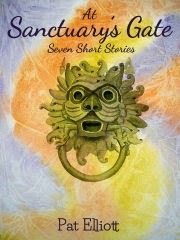 I hope you tackle this project - and get as much enjoyment from it, as I did. 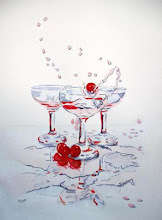 today I show you a painting I made over the recent holidays. 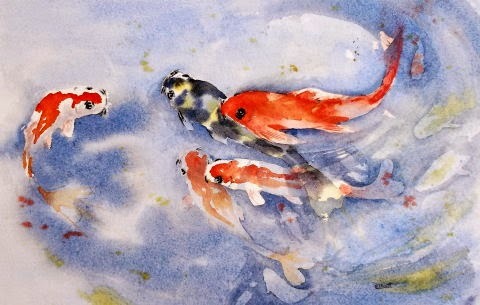 It's a study of koi fish, which are kept in a garden pond.